FOR MACDONALD'S LIBERAL-CONSERVATIVE GOVERNMENT of the First Parliament of Canada, continental trade was problematic. In the very year before Confederation, a bi-lateral trading agreement with the United States had expired. The Reciprocity Treaty had been of great benefit to Canadian industry but the United States steadfastly refused to renew it. 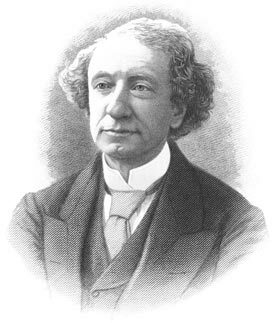 Prime Minister John A. Macdonald (pictured) bided time during his first administration, administering a moderate policy of customs enforcement. American fishing vessels were required to obtain licenses when fishing in Canadian waters. In 1868, the fees were substantially increased. American fishermen balked and responded by fishing without license. On January 8, 1870, the Canadian government suspended the licensing system and set afloat police cruisers. Seizures were made and the stage was set for a showdown. In the American capital, President Grant, in his 1870 opening address to Congress threatened retaliation. Macdonald could skirt the issue no longer. On February 1, 1871, events fell into place, offering him both a politically acceptable solution, negotiated and fully endorsed by the Imperial government. During the months of March and April, 1871, the Prime Minister of Canada was stationed in Washington, D.C., acting as a member of a Joint High Commission to discuss issues of concern between England and the United States. Ten commissioners convened in the American capital, and included Earl de Grey and Ripon, President of the Imperial Privy Council and Hamilton Fish, the American Secretary of State. The Canadian Parliament was not sitting when the Treaty of Washington was signed on May 8, 1871. From the apposition of his signature on the parchment until the day he scheduled House time to table the Treaty, Macdonald refrained from public comment on the Treaty. The interim was not a quiet one. In September, 1871, an American schooner E. H. Horton was seized for fishing in Canadian waters without license. A month later, left unguarded, the ship's moorings were quietly cut. The vessel escaped to Gloucester, Massachusetts and became the subject of much embarrassment to Canada. May 3, 1872 was the day for Macdonald's statement. Canada's first Prime Minister usually compressed speech notes on the back of a used envelope. Rare were the times when he would speak with any great degree of preparedness. But the speech he offered in the House of Commons, introducing the Washington Treaty was different, and was the object of meticulous preparation. His biographers refer to it as one of his greatest speeches. RIGHT HON. SIR JOHN A. MACDONALD - Prime Minister (Kingston): Mr. Speaker, on proceeding to Washington, an American statesman said to me, "the rejection of the treaty now means war." Not war tomorrow or at any given period, but war whenever England happened to be attacked from other sources. You may therefore imagine, Mr. Speaker, the solemn considerations pressing upon my mind if by any unwise course or from any rigid or pre-conceived opinions, we should risk the destruction for ever of all hope of a peaceable solution of the difficulties between the two kindred nations. Now, unless I am greatly misinformed, the fishing interests with one or two exceptions for local reasons in Nova Scotia, are altogether in favour of the treaty. They are anxious to get admission of their fish into the American market. The only market in the world for the Canadian number one mackerel is the United States and they are practically excluded from it by the present duty. The consequence of that duty is that they are at the mercy of the American fishermen. They are made the hewers of wood and drawers of water for the Americans. Let any one go down the St. Lawrence on a summer trip, as many of us do, and call from the deck of the steamer to a fisherman in his boat and see for what a nominal price you can secure the whole of his catch, and that is from the absence of a market and from the fact of the Canadian fishermen being completely under the control of the foreigner. When someone writes my biography - if I am ever thought worthy of having such an interesting document prepared - and when as a matter of history, the questions connected with this treaty are upheld, it will be found that upon this, as well as upon every other point, I did all I could to protect the rights and claims of the Dominion! I shall now move the first reading of this Bill. Reject the treaty, and you do not get reciprocity. Reject the treaty, and you leave the fishermen of the maritime provinces at the mercy of the Americans. Reject the treaty, and you will find that the bad feeling which formally and until lately existed in the United States against England will be transferred to Canada. The United States will say, and say justly, "here, when two nations like England and the United States have settled all their differences and all their quarrels upon a perpetual basis, these happy results are to be frustrated and endangered by the Canadian people, because they have not got the value of their fish for ten years." I was perfectly aware in taking the course I did in signing the treaty, that I should be subject to reproach. Well I knew the storm of obloquy that would meet me on my return. Before even I crossed the border I was complimented with the names of Judas Iscariot, Benedict Arnold, etcetera. The whole vocabulary of Billingsgate was opened against me. But here I am, thank God, today, with the conviction that what I did was for the best interests of Canada. After the confidence that has been accorded me for so many years, I would have been unworthy of that position and that confidence if I were not able to meet reproach, and I have met it in silence. I have not said a word for twelve months. How eagerly was I watched! But silence is golden, Mr. Speaker, and I kept silence. We come down here and ask the people of Canada, through their representatives, to accept this treaty, to accept it with all its imperfections, to accept it for the sake of peace, and for the sake of the great Empire of which we form a part. I now beg leave to introduce the Bill, and to state that I have the permission of His Excellency to do so. The House ratified the Washington Treaty by a large majority of 121 to 55. For Macdonald, the Treaty was the last piece of his electoral platform for the 1872 federal election, an election which would return his Conservative party to power, but with a small majority of six over Blake and Mackenzie's Liberal party. The subject of free trade with the United States remained a pivotal issue for Canadian lawmakers for years to come, culminating in the North American Free Trade Agreement signed in the early 1990s.